Billionaire businessman Mike Ashley has increased his stake in Newcastle United to 93.2% - which will allow him to remove the club from the stock market. Having accumulated more than 90%, he can now force the remaining shareholders to sell their stakes. The cancellation of Newcastle's listing is expected to take place on 18 July. Mr Ashley, who runs the Sportsworld chain and Lillywhites, is one of many investors lured by the world's richest football league. In the past few months investors, mostly from overseas, have swooped for clubs including Liverpool, Aston Villa and West Ham and Birmingham. 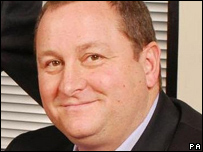 Mr Ashley bought a 41.6% stake from the family of Sir John Hall through his company St James Holdings Limited in May for £55m. He later convinced chairman Freddy Shepherd to sell his 28% stake in the Premiership football club. Analysts said that football clubs were seen as cash cows by many investors, especially after they re-negotiated overseas TV rights. Despite not winning any silverware since 1969, apart from being awarded the Intertoto Cup in 2006, Newcastle is one of the UK's best-known and best-supported clubs, giving owners a large market for merchandising. Newcastle is Europe's 13th wealthiest club by annual revenues. Last month the club appointed former Bolton boss Sam Allardyce as manager.